It’s human nature. When one first steps foot into a disaster zone a single thought occupies the forefront of the mind. How can I help? 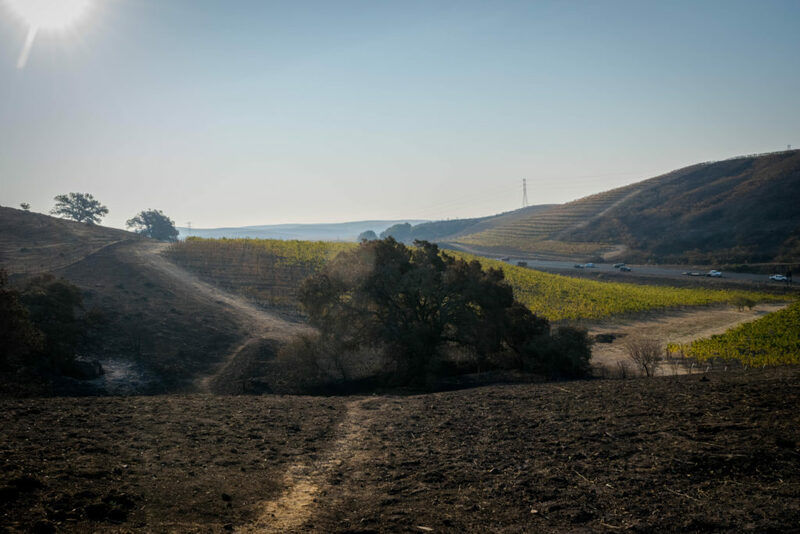 As we emerged into the heart of Northern California’s Napa Valley we began encountering the scenes of human triumph and tragedy and that defining question of how to help gradually became a complex one. 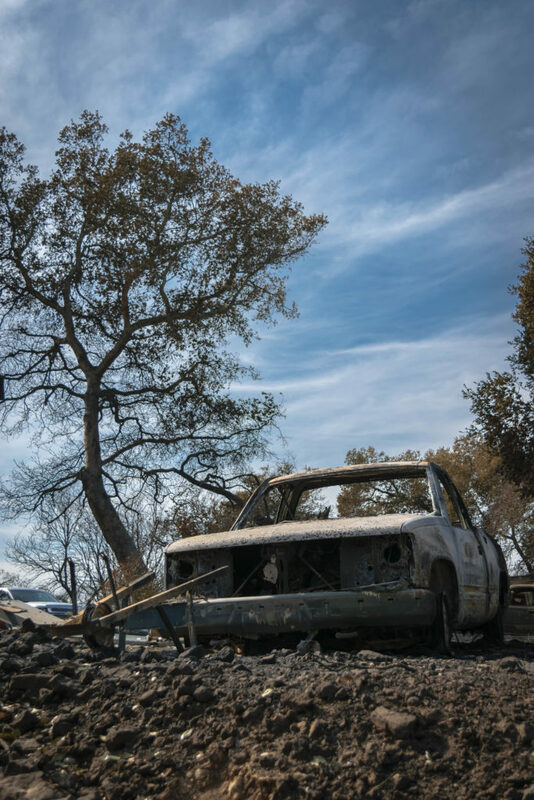 Almost a week since the first sparks turned the state’s famous wine country into an inferno we arrived to a grim reality. Assaulting the region from all sides, fires raged out of control. Already the cost was too high. A growing number of fatalities, whole neighborhoods burned to the ground. Businesses, livelihoods snuffed out. Lives changed forever. Pulling over on Highway 29 through the heart of Napa we sat on the shoulder and watched in awe as a dramatic spectacle unfolded. Beyond vineyards and rows of grapes the mountains west of the highway looked apocalyptic. Massive columns of smoke spewed skyward from the hills. Great plumes of ash and soot headed towards the heavens, merging into a great dark cloud that blotted out the sun. The thump of rotors was loud and constant. Like a hive of worker bees the helicopters buzzed overhead. Of every shape and size, from far and wide they came to battle the blaze. They moved in perpetual rotation. With buckets and bags they landed amongst the vineyards. Refilling at reservoirs that once kept the grapes of California’s finest wines watered. Now they served as salvation, a resource to keep the valley from oblivion. 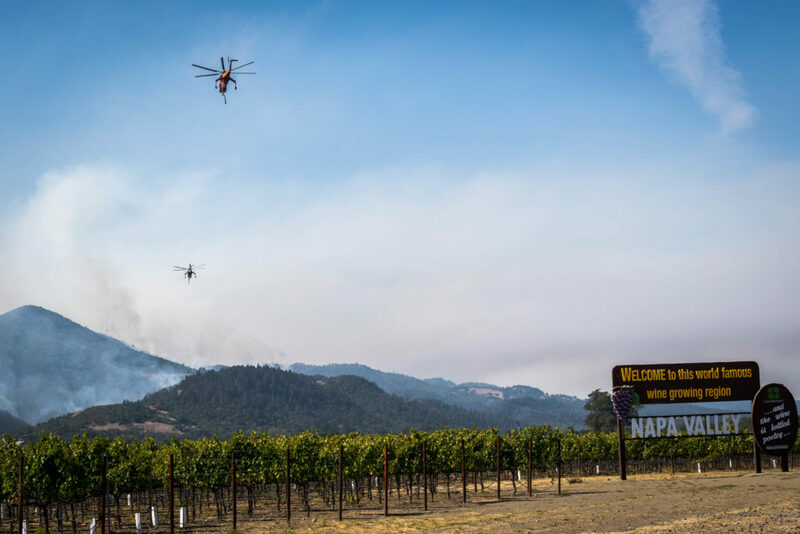 Once airborne, they sped towards the hills, hastily dumping their payloads amongst the flames then banking and turning back towards the vineyard to repeat the cycle. The fire was so massive, its scope so far reaching the effort seemed futile, but invaluable. I knew with each bucketful it bought Napa Valley a little more time. We made our way to the eastern edge of the valley. Up towards Atlas Peak, an area devastated when the fires first broke out. Past a National Guard checkpoint we were escorted up a winding road into a landscape transformed. The fire had since done its grisly work. Charring trees and power lines. Scorching the earth, turning the grass into chalky ash. The skeletons of cars sat in cracked driveways. Amongst the rubble, shadows were cast by solitary chimneys; the only indication a person once made their home here. Smells mingled to create an aroma that turned the stomach. Synthetics and chemicals. Melted metals and alloys. Acrid organics and incinerated foliage. The unmistakable stench of death as we passed by the bloated and burnt remains of livestock and woodland creatures. Not even swift deer could outrun the fire’s fast advance. Standing on the ruined property of one Atlas area business owner he described the fateful night the fires started and the stunning speed at which they spread. “I was sitting on my couch watching Sunday night football when I first saw the glow.” he pointed off towards the far horizon. He went on to describe his flight down the mountain towards the eastern edge of Napa. Fleeing neighbors and the pursuing fire right behind him. The wind playing a major factor in the fire’s quick march forward he described tornadoes of embers, illustrating the inferno with twirling hand motions. Towards the top of Soda Canyon Road another winery owner looked out over the remains of his home. For all the destruction he endured he counted himself lucky. His neighbors on one of the adjacent properties were still among the missing. For all the stories of heartbreak and loss we heard from the community we also encountered tales of courage, compassion, and human endurance. Before first responders were on the scene it was neighbors and community members that stepped up in their place. Clearing fallen trees from the road with tow cables and pick-up trucks to create a safe path down the mountain. Individuals running door-to-door, banging on windows to wake up sleeping neighbors. Citizens storming back into the inferno to rescue pets and stranded livestock. This triumph of the human spirit was supplemented by miraculous situations that seemed to bring with them a touch of the divine. 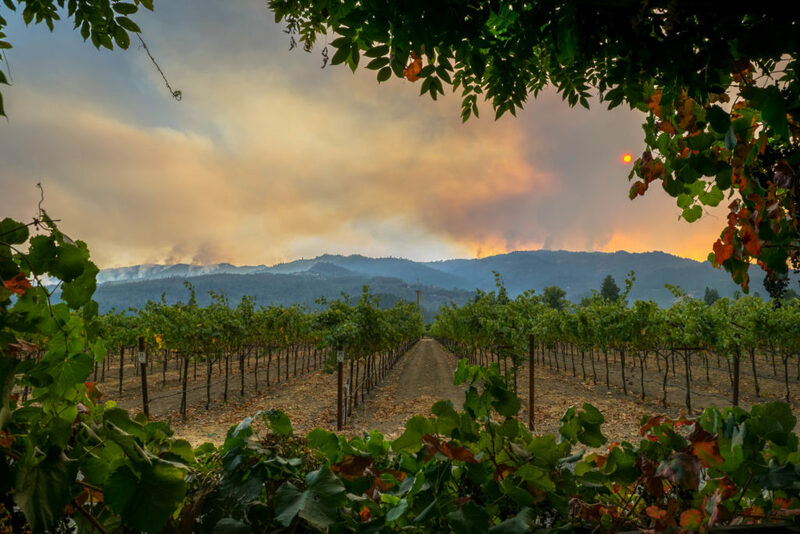 One winery up in the path of the Atlas fire seemed halted by an act of god. The owner and business upstart told us how he had been building his winery for over 10 years, much of it with his own two hands. 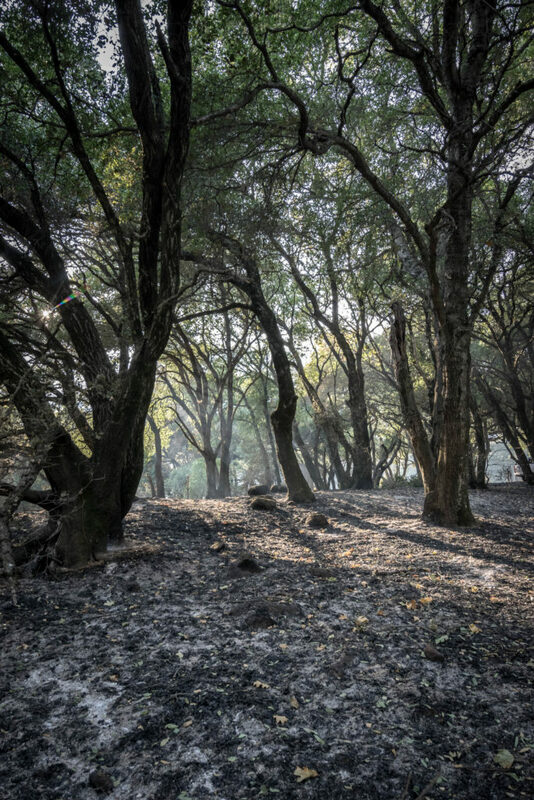 We walked his property, everywhere torched trees and blackened earth. The fire swept through his land but when it encountered the main house and tasting room it seemingly detoured. Forming a neat ring around the building, the fire encircled it and moved on. Showing us photos from the night of the fire tears welled up in his eyes. As shell shocked survivors awoke the next morning the community began to mobilize. An army of firefighters and first responders descended on Northern California from over a dozen states and as far away as Australia. Local businesses opened their doors to those affected with food and shelter. People posting signs of strength, thanks, and perseverance began popping up all over the region. 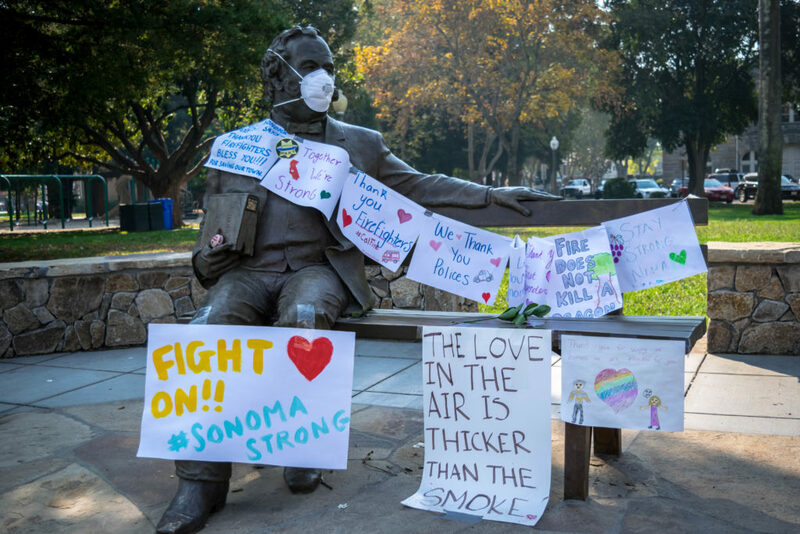 Sonoma Strong, The Love In the Air is Thicker Than the Smoke, Napa Strong, Fight On. Love and support poured out across the state. It’s human nature. As we moved throughout Wine Country meeting with friends and strangers our role in the order of this devastating event became clear. Helping became so much more than financial aid. It was being an ear to listen when someone in shock needed to vent their frustrations. It was a comforting hand on a shoulder when emotion made it too difficult to speak. It was sitting over drinks letting someone share their story of survival. When one first steps foot into a disaster zone a single thought occupies the forefront of the mind. How can I help? We had found our place in the order of things. And we were here to stay. If I could write. I’d want to speak like you. Thank you so much. Wonderfully sad but inspiring story. God bless the people and the land. Justin, I feel I was physically with you, seeing what you were seeing and smelling what you were smelling. My heart goes out to those people. I would like to subscribe to Winery PAK Press. Please notify me when the next news item is published.